Bill that would fully fund LWCF receives wide bipartisan support, heads to Senate. On the heels of a decisive vote to permanently reauthorize the Land and Water Conservation Fund under the John D. Dingell Jr. Conservation, Management and Recreation Act in February, Senate leaders from both sides of the isle joined together to put forward a bill that would fully and permanently fund the LWCF at the originally intended annual level of $900 million. The Land and Water Conservation Fund Permanent Funding Act was introduced by Senators Joe Manchin (D-WV), Ranking Member of the Senate Energy and Natural Resources Committee, and Cory Gardner (R-CO). They were joined by Senators Maria Cantwell (D-WA), Richard Burr (R-NC), Michael Bennet (D-CO), Lamar Alexander (R-TN), Jon Tester (D-MT), Steve Daines (R-MT), Tom Udall (D-NM), Susan Collins (R-ME), Martin Heinrich (D-NM), Lindsay Graham (R-SC), Jeanne Shaheen (D-NH) and Angus King (I-ME). Since 2014 AFFTA has proudly supported over a dozen fisheries conservation- and education-focused organizations and projects with grants through the Fisheries Fund. Our goal is to provide direct support to those who are boots-on-the-ground, helping to ensure the health of the sport and fish we love and the places we enjoy them for generations to come. 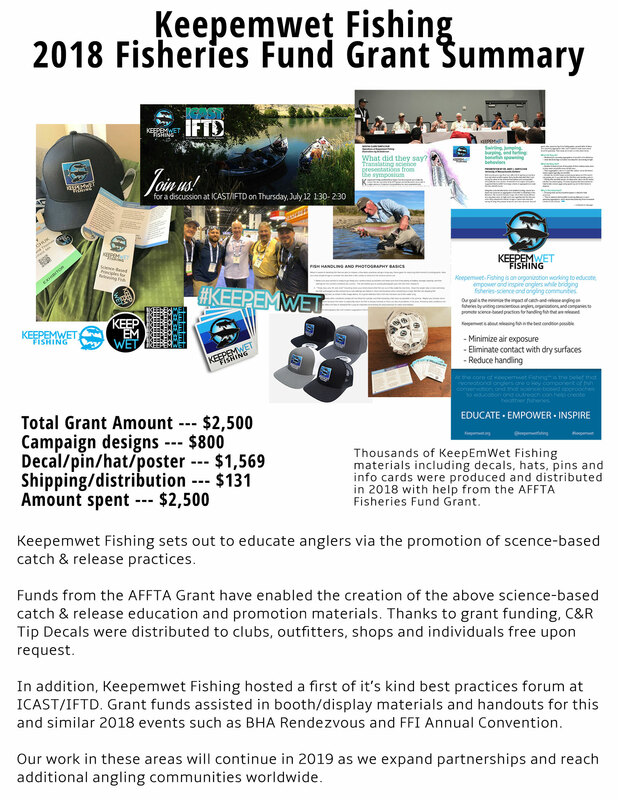 Keepemwet Fishing was a grant recipient in 2017 and again in 2018 – and also hosted a stellar panel discussion at IFTD 2018 in Orlando. Their work in raising awareness of proper catch-and-release fish handling techniques to reduce fish mortality is important – and gaining much-needed attention throughout not only the fly fishing community, but the larger angling world as a whole. Read more in their summary below. If you’d like to support organizations and efforts like Keepemwet and more, click the link >> to learn more and make a donation to the Fisheries Fund today.